1. Most Women use face-washes, does that mean its a FEMALE thing? Answer: A big NO! Dear Men, facewashes are meant for everyone irrespective of gender. Its just that women adapted to those much faster than you, as they realised the benefits. Also, brands started their pilot with women as women are more keen on skincare than men. 2. Why do I need a FACEWASH when I have my SOAP BAR/Shower Gel? Dear Men, your facial skin is more delicate than the rest of the body. Do you know that you have a skin ,that is rougher and drier than a woman's skin? That's because of a different biology. You constantly use after shave lotions that can be drying your skin further. Soap bars are known to be drying . So why would you use them to dry your skin anyways? The extra moisturizing and nourishment can be achieved by using a facewash that is formulated specifically for Men. Its only when you start using it, will you know the difference. 3. I still don't think FACEWASH is important. I have an oily skin!!! Do you know men have more sebaceous gland than women? Which means your skin produces more oil. Not only that, when your skin becomes dry due to soaps/shaving lotions , the skin's oil mechanism over-activates and produces more oil than needed. Hence you end up feeling oily. What if a product balances the drying act? Then you will be on your way to a normal skin. 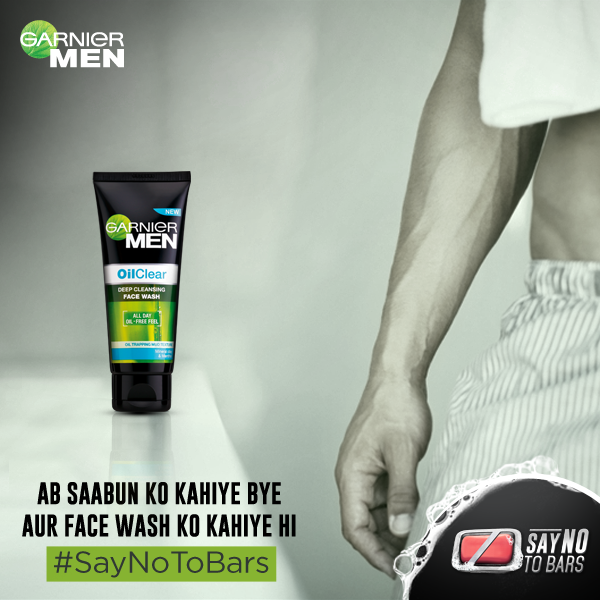 SWITCH to GARNIER MEN OIL CLEAR facewash, and see the difference. If I have generated enough interest, you might want to use the GARNIER MEN PLAYBOOK here. Men gotta be tough, not their skin! Nice post. Its high time start taking care of themselves. Please participate in Giggles giveaway on my blog.